Another layered dessert in the making!!! The number of hits on my blog crossed the 1500 mark today… I must thank all my readers for that. And because you have been so encouraging, I decided to write up the entremet recipe up sooner than I would have otherwise. It seems apt that I write up a dessert recipe to celebrate the occasion. So as an extension to this month’s daring bakers challenge, here are the recipes to create the layers in the entremet; the chocolate mousse and the raspberry cream. I was looking for a Julia Child Chocolate Mousse recipe and since I do not have the cookbook, I had to resort to searching for an adaptation of it on someone’s blog. I have listed the link at the end of this blog. David Lebovitz had the perfect recipe put together with some awesome pictures which gave me the impetus to try out his adaptation of the Julia Child Chocolate Mousse recipe. The end result had both the decadent taste and perfect texture. 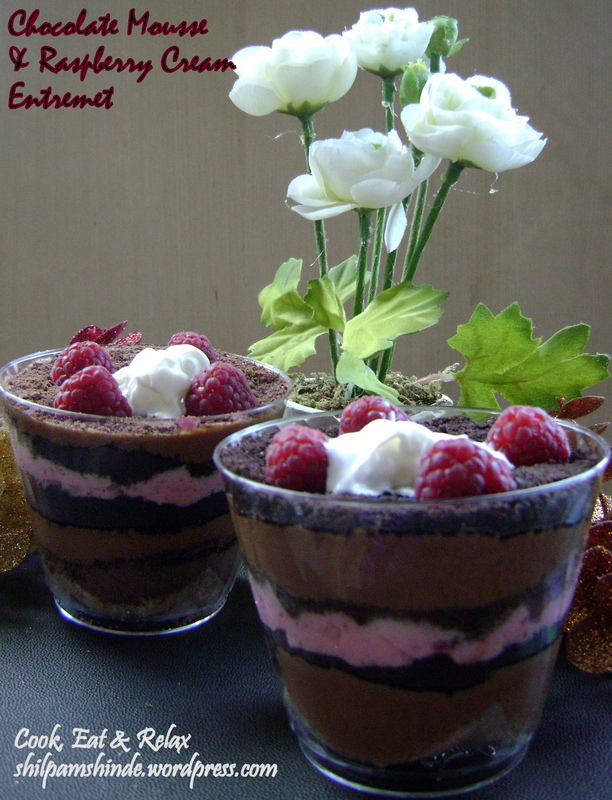 Both the chocolate mousse and the raspberry cream come together very well. The flavors are a perfect pairing. This recipe makes about 6-8 servings. Use a double boiler. Fill the saucepan with water and bring it to a boil. In the other bowl set on top of it, melt the chocolate and butter. Once this is melted add the brewed coffee. Once the mixture is a smooth paste, remove the melted chocolate, butter and coffee from the double boiler. Remove the mixture from the double boiler and put it inside a bigger bowl of ice water. Now continue beating the mixture till it is cool and thick. Then add the chocolate, coffee, butter mixture to the whisked eggs yolks. Beat the egg whites and the pinch of salt in a clean bowl. Whip until the eggs are firm and holds peaks. Now add the vanilla extract and mix it completely. Fold in the egg whites (1/3rd of it at a time into the chocolate mixture). Do not overmix, just make sure that the egg whites are completely incorporated. 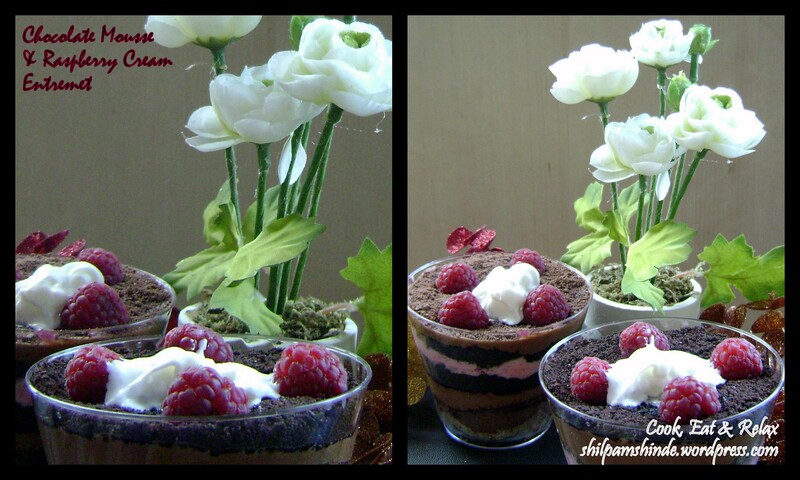 Place the chocolate mousse in the refrigerator till the mousse has firmed. Add the raspberries, sugar and water to a saucepan on a medium flame. Bring the mixture to a boil then let it simmer till the mixture reduces to 2/3 of the initial amount. In the meanwhile dissolve the gelatin in 1/4 cup of the raspberry mixture. Once the gelatin has dissolved completely, transfer the 1/4 cup back to the raspberry mixture. Set the raspberry sauce aside. In the meanwhile whip the cream till it forms firm peaks. Fold the cream into the raspberry sauce till is completely incorporated. Let the raspberry cream set in the refrigerator for about 4-6 hours or till firm. Once the Chocolate Mousse and Raspberry cream set, you can start serving the dessert into bowls or inside the biscuit joconde imprime. I used layers of the joconde imprime, ground chocolate graham crackers, chocolate mousse, ground chocolate wafers & raspberry cream. I topped it off with some whipped cream and raspberries. Chill this for an hour or two before serving. This is definitely a high calorie dessert but you are allowed to indulge once in a while. The link for the chocolate mousse recipe is http://www.davidlebovitz.com/2008/05/perfect-chocola/. This can be made a day in advance and ready to serve for a party. You can thereby save yourself some time on the day of the party. 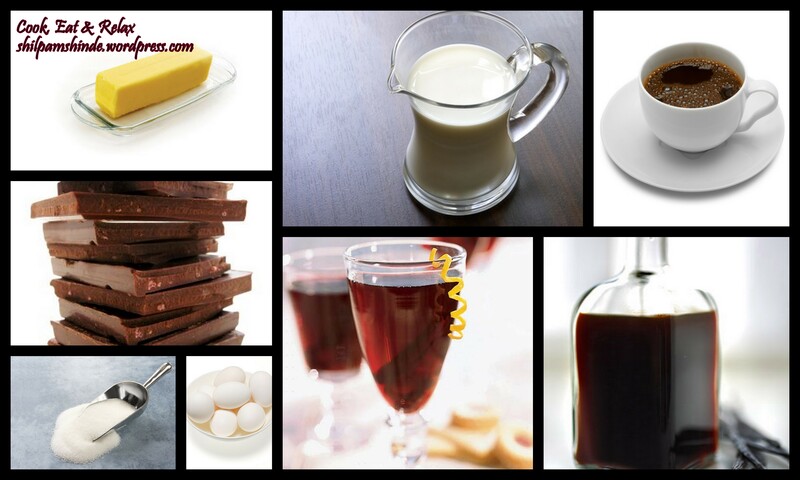 I assure you that you will love this recipe. Raspberries and chocolate flavors come together very well along with the graham crackers and the chocolate wafers. And cheers to all my blog readers, thank you for all the encouragement and I hope to be able to get you to continue visiting my blog in the future too. This entry was posted in Desserts and tagged chocolate, chocolate mousse, chocolate wafers, dessert, entremet, graham crackers, julia child, layered dessert, mousse, raspberry, raspberry cream. Bookmark the permalink.